Published by Tor, an imprint of Pan Macmillan. A couple of things made that day stand out more than any other: it was my sixth birthday, and my mother was wielding a knife. Not a tiny steak knife, but some kind of massive butcher knife glinting in the light like in a bad horror movie. She definitely wanted to kill me. When Wendy Everly was six-years-old, her mother was convinced she was a monster and tried to kill her. It isn't until eleven years later that Wendy finds out her mother might have been telling the truth. With the help of Finn Holmes, Wendy finds herself in a world she never knew existed - and it's one she's not sure if she wants to be a part of. I was attracted to this book from the moment I heard about it. The author Amanda Hocking had received a lot of press lately and I was intrigued by her journey from self publication, to an established publisher. The cover enticed me enough to read it and from the first paragraph I was hooked and had to read it until the end. If you have read the snippet I have included above, you can see how easily you are trapped and need to find out more. Wendy is a quirky character; the girl who just doesn't fit in - anywhere. She struggles at school, she finds it difficult to make friends and she is definitely the one that just doesn't fit. It isn't until you realise how different she actually is, that you really begin to understand her. Finn enters the book and things begin to change dramatically for Wendy. Finally she feels she has found someone who understands her. There is a scene at the school prom, where they dance to OMD's 'If You Leave,' which melted my heart and took me straight back to my teens. Amanda Hocking is a self confessed John Hughes fan, and anyone who loved his films will remember the scene from Pretty In Pink where that song was played! Sigh. Finn is a fabulous male lead. His relationship with Wendy has that Romeo and Juliet feel to it. It is forbidden and definitely frowned upon as they far to different and from different sides of the track. If you were thinking that Finn might be the only love interest for Wendy, you would be mistaken as Rhys and Tove also seem to show affection for our leading lady; so I am curious where this story will go. Wendy's arrival in Trylle marks a change in the way the other residents live. Wendy will change things in the future, that I am almost certain, as she is unhappy with the way their society is segregated. You can see the way her mind works and you only hope the social classes set up will tumble in time. 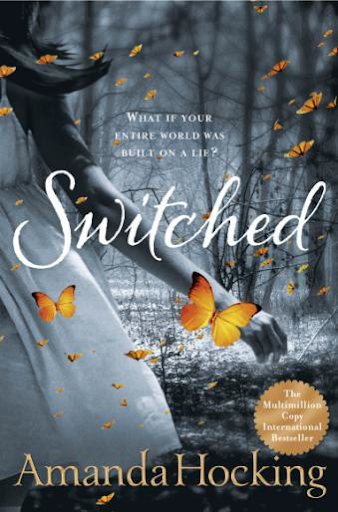 This book felt like a mixture of Holly Black's faerie books and Meg Cabot's Prinice Diaries. I can't think of another way to explain it. I loved the book completely and I am eager for the second book in the trilogy. I went to meet Amanda Hocking at her book signing at Forbidden Planet! Fab review - this was already on my wish list but now I want to read it even more! Amanda Hocking is definitely on my list of authors that rock! Go buy it. I'm looking forward to reading this book, and glad to see you liked it! I'm always a bit nervous reading something that has been hyped up a lot, because I don't wan to be disappointed by it. I am such a eager beaver! I have to read the hyped books. Quirky characters I like, this sounds like a book both niece #2 (13) and I would enjoy, thanks for the recommendation Vivienne. No worries. I think it is fabulous. No worries. I hope you enjoy it as much as I did. itunes has this as a free sample and I downloaded the first 3 chapters (i think) last week. Can't wait to read the rest! They also had a sample for Hereafter, which I just downloaded from my library. I didn't really enjoy Hereafter. I am a bit picky iwht my ghost stories. Wow, I'm wondering what in the world is the matter with Wendy's mother. This book sounds great! I know! You have to read it! Great review, I definitely need to give this one a go. I have a copy of this one but haven't read many reviews until now. Love the new covers for the series, but I'm wondering if it will all be a little bit too fantasy for my liking. I'll have to check it out and see! It was a lot more fantasy than I had thought it would be. Very much in the Trylle world rather than real life. Great review, Vivienne, ad how wonderful that you went to the book signing at Forbidden Planet! I have ahd Amanda Hocking on my TBR list. Wow, so cool that you got to meet her! Great review! I'm not sure whether to try this one or not as I struggle with fae type books! I want to y it though! a plastic card, car loans or mortgage inside future. piercy, owe $380,000 on the credit for his or her home in shasta lake, calif.
have to have a government-backed education and learning loan. to find your personal financing which has a company who specializes in helping people like you. knowledge about where to deliver potential solutions on his or her website.